Liberty Hall is a nationally significant historic place whose history helps form a common bond between all Americans. No visit to Kentucky is complete without touring the house of one of Kentucky's founding fathers, Senator John Brown. While there are many historic places in Kentucky and across the nation, only a small number are National Historic Landmarks. In 1971 the federal government designated Liberty Hall as a National Historic Landmark. The Secretary of the Interior deemed the site to possess value and quality in illustrating and interpreting the heritage of the United States. Today, fewer than 2,500 historic places bear this national distinction. Explore our site. With its Georgian and Federal details, Liberty Hall is one of the finest examples of early American architecture in Kentucky. Home to four generations of Brown family members, the house showcases family furniture and art. Next door, the 1835 Greek Revival home of John Brown’s son Orlando houses family furniture and portraits and a museum store that specializes in gifts and books inspired by the collections. Four acres of formal and informal gardens bordering the Kentucky River provide a chance for a restful stroll. Discover the Brown family by touring their homes. At Liberty Hall, first-floor rooms restored to the early decades of the 19th century will immerse you in the daily life of Senator John Brown and his family. Active citizens in early Frankfort, the Browns hosted presidents, war heroes, and other dignitaries but suffered their share of domestic tragedies. The kitchen and laundry illustrate the activities of enslaved workers who labored here. The second floor houses the Senator John Brown Library and Archives, the exhibit Kentucky Made: Decorative Arts from the Liberty Hall Collection, and the bedroom where the famous Gray Lady spirit has been spotted. Furnishings and portraits at the Orlando Brown House interpret the family and descendants of writer and editor Orlando Brown. Learn more early Kentucky history by exploring the neighborhood and visiting downtown Frankfort. Diverse architectural styles and historical markers make Senator Brown’s neighborhood a fun area to stroll. Within blocks of the site, you can view the homes of George M. Bibb, James Brown, John J. Crittenden, Thomas Metcalfe, Charles Slaughter Morehead Morehead, Thomas Todd, George G. Vest, and John C. Watson. Nearby downtown Frankfort boasts unique shops and restaurants, as well as B&Bs and hotels. The Old and New State Capitols, the Capital City Museum, and the Frankfort tourism office are also just a few blocks away. Support us by attending the best spring bourbon bash in central Kentucky. Liberty Hall Historic Site's annual fundraiser, Bourbon & Browns, features live music, dinner on the grounds, live and silent auctions, and of course bourbon! Attend a family-friendly program, an informative talks, and other events that combine history, nature, and fun. 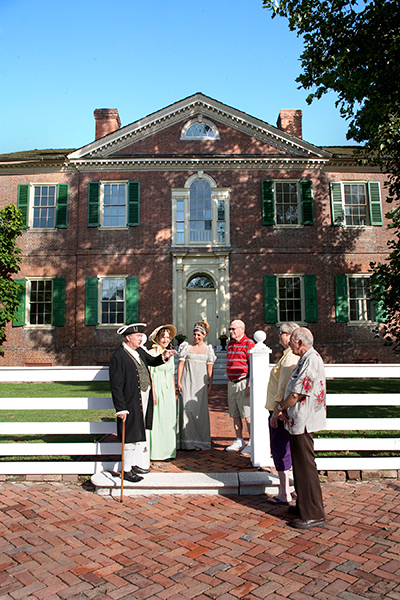 Tour the home of Kentucky founding father and U.S. Senator and his fascinating family. Guided tours are offered Mon.-Sat. at 1:30 p.m.